Bernard Rapoport's death at the age of ninety-four has brought to a close one of the storied chapters in the history of American liberalism. Bernard Rapoport’s death at the age of ninety-four has brought to a close one of the storied chapters in the history of American liberalism. Rapoport was among the last of a robust generation of enlightened capitalists who steered sizeable portions of their enormous wealth toward the advancement of social progress. I first encountered B., as he was universally known, in the company of Palmer Weber, the charismatic and tireless labor and civil rights campaigner from Virginia who ran afoul of the blacklist following his close association with the 1948 Henry Wallace campaign. 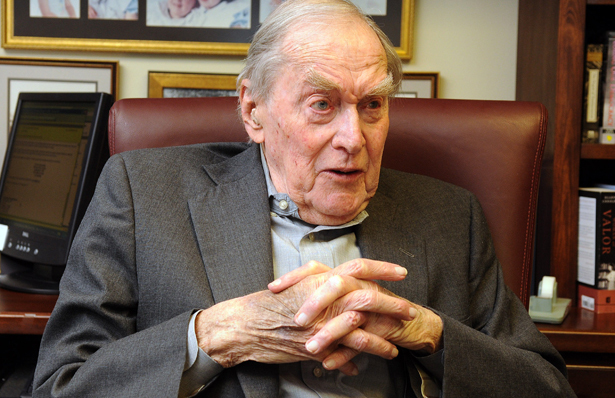 Weber became a Wall Street analyst in the 1950’s, and specialized in ferreting out independent energy companies and other promising ventures below the radar. He famously tithed his wealthy liberal clients a portion of their profits for progressive organizations, with the ACLU, the NAACP and The Nation, thankfully, high on his list. Palmer and I traveled to Texas together in the 1970’s to make the rounds of libertarian oilmen, progressive insurance executives and blacklisted television and radio personalities who for different reasons understood and valued the independent press. I returned to Texas often over the years and came to know and appreciate many of the courageous and colorful characters who comprised the intellectual and cultural left in the state – the wise and contrary columnist Maury Maverick; Sissy Farenthold, the liberal Texas state legislator whose name was placed in nomination for Vice President at the Democratic Convention in 1972, only the third woman to have been so honored by that time; Ronnie Dugger, founder of the Texas Observer, which Bernard helped sustain for forty years; John Henry Faulk, the blacklisted radio personality who took McCarthy to court and won; the famed populist Jim Hightower; Molly Ivins, of course, the peerless raconteuse whose wry chronicle of the preposterous Texas state legislature (lately starring Rick "Governor Good Hair" Perry), discerning columns and best-selling books established her among the leading progressives and most sought after speakers of her era; J.R. Parten, the oil and gas king and former New Dealer, "the real JR" in Molly’s account, who together with Bernard helped to finance Democrats across the state, including both of Sissy’s unsuccessful gubernatorial campaigns; and now Lou Dubose, the former Editor of the Texas Observer who together with Molly co-wrote Shrub and Bushwhacked on the rise of Texas’ favorite prodigal son, and with whom I am now grateful to be collaborating on our mutual stewardship of the Washington Spectator. Surrounded by books and papers in his offices at the Wells Fargo Bank Building in Waco, B. presided raucously over the lives, aspirations and welfare of these and countless other Texans drawn from all walks of life. And casting his shadow well beyond Texas, he contributed to the coffers of just about any Democrat with a pulse, and left his mark on countless publicly spirited enterprises – among them Robert Hutchins’ Center for the Study of Democratic Institutions in Santa Barbara , the Institute for Policy Studies and the Economic Policy Institute in Washington, and The Nation and the Roosevelt Institute in New York. The central Texas town of Waco, population 125,000, straddles the interstate between Dallas and Austin. Local highlights include the Dr. Pepper Museum, the Texas Ranger Hall of Fame and the occasional billboard promoting reverse vasectomies. The Brazos, the river that shaped Waco’s nineteenth century origins, runs through town on the north side and on down through the middle of the state before emptying into the Gulf. Just ten miles to the west of Waco lies Crawford, the western home of former President George W. Bush and the site of the widely reported protest organized in part by Code Pink and Cindy Sheehan at the height of her compelling crusade against the Iraq War. Waco is struggling. Nearly a quarter of Waco households report incomes of less than $15,000, more than twice the poverty levels in the rest of the state. Christian and conservative, Waco is home to Baylor, one of the leading Baptist universities and a powerhouse in college athletics. The Wings for Christ Flight Academy, with its oddly unambiguous tag line, "Dedicated to Serving Jesus Christ through Aviation," operates an airstrip on the outskirts of town. The main office of Planned Parenthood of Central Texas is located just off I-35. It’s called the The Audre Rapoport Women’s Health Center. Waco also boasts the Audrey Rapoport Library, and the Audre and Bernard Rapoport Academy, which serves 178 largely Hispanic and African American children from pre-Kindergarten through fourth grade. Nothing was closer to Bernard’s core than family and education. He and Audre adored their son Ronnie (the respected political scientist and author of the invaluable Three’s a Crowd, on the role and impact of third party politics), and doted on their granddaughters Abby and Emily Palmer (named after Bernard’s longtime friend) to the outer limits of their ability. They devoted millions to education, establishing numerous chairs in economics and public affairs, liberal arts, and government, all at UT Austin. They donated millions to the UT M.D. Anderson Cancer Center in Houston, and established endowed chairs in pediatric endocrinology, clinical care and research, and cardiovascular research – as well as a center for cardiovascular research – at UT Southwestern Medical Center. But to appreciate Bernard’s indelible impact on American public life over the last fifty years, you have to go well beyond his adopted town of Waco and even the state of Texas as a whole. History will record that for much of the second half of the twentieth century and well into the twenty-first, the road to the White House led south of Dallas through the Central Texas town of Waco – at least if you were a Democrat. Every national candidate since Hubert Humphrey counted on Bernard to help make them competitive, and all of them considered him a confidant and friend, none more so than Arkansas Governor William Jefferson Clinton who called his fellow Southerner to Little Rock to help draw up the plans for a presidential run. Nor did he limit his contributions to those seeking the presidency. Long before Super Pacs, Corporate Personhood, and the Swift Boat campaign funded by several of his neighbors, Bernard spent his days fielding calls from Democratic candidates from Maine to California, exaggerating his trademark Texas drawl only slightly whenever northerners came on the phone. Over the past ten years I drove up to Waco to stop in on Bernard and Audre as often as six times a year, and on most days after work, as Lou Dubose has chronicled in his affecting tribute in the Texas Observer, we’d head over to the Outback Steak House. Often we’d be joined by Lyndon Olson, the big-hearted former Ambassador to Sweden from the Clinton era, or Chet Edwards, the conservative Democrat who with Bernard’s help miraculously held on to the Congressional seat that included Waco for twenty years. Bernard and Audre would take their time consulting their laminated Outback menus and interrogating the waiters, and most nights they’d select the New York Strip. Audre always asked for her steak Pittsburgh style – charred on the outside and rare on the inside – and usually she had to explain how the meat should be prepared. With the ordering finally concluded Bernard would pause and then turn to me as he had with countless dinner guests before. "Now let me ask you a question," his voice gathering like a storm above the Texas plain, "When too few have too much, and too many have too little, how is this country going to survive?" As always, his plain spoken words captured an essential truth, and I wish now I had better answers for this widely-cherished and unassuming man who spent his life in gratitude giving everything he had.